Gressenhall Farm and Workhouse is inviting players of the National Lottery and their families to come along for a free Lottery Players’ Preview before the start of the 2018 season. Welcome to the Workhouse will take place from 10am to 5pm on Saturday 10 March. This event is the museum’s way of saying thank you for all the good things that the National Lottery has funded at Gressenhall over the past few years through the Heritage Lottery Fund. This includes the £1.8m Voices from the Workhouse project which has seen the complete redevelopment of Gressenhall’s Grade II-listed Georgian workhouse buildings. This project was supported with major investment from the Heritage Lottery Fund – just one of the ways that the National Lottery helps good causes. Visitors will have the chance to explore the new galleries and find out about what life was like within the workhouse walls through the stories of those who lived and worked there over its 200 year history. They will be able to discover the research behind these displays and get some tips on how to delve into their own family history. 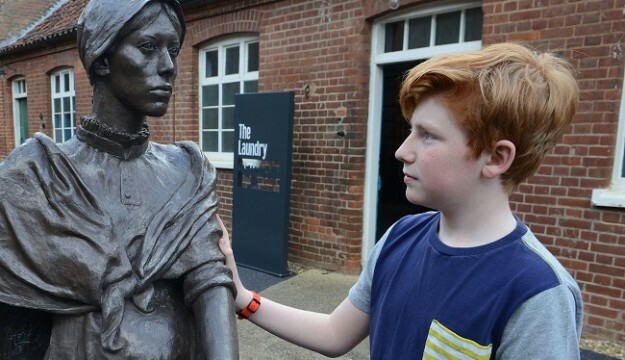 They can meet costumed characters and get creative with a range of activities inspired by the stitched letters of workhouse inmate Lorina Bulwer. The event also marks the completion of the new-look Collections Gallery with over 2,000 objects telling the story of life, work and play across the county. After that, visitors can pause ‘at the bar’ to recall Norfolk’s rural pubs with a new special exhibition, Beer and Brewing: Norfolk’s Rural Pubs. Plus, they will be able to discover all that the 50 acre site has to offer including the traditional working farm with its Suffolk Punch horses and thrilling adventure playground. Admission is FREE to all National Lottery players and their families – just show a valid lottery ticket for that week upon entry.